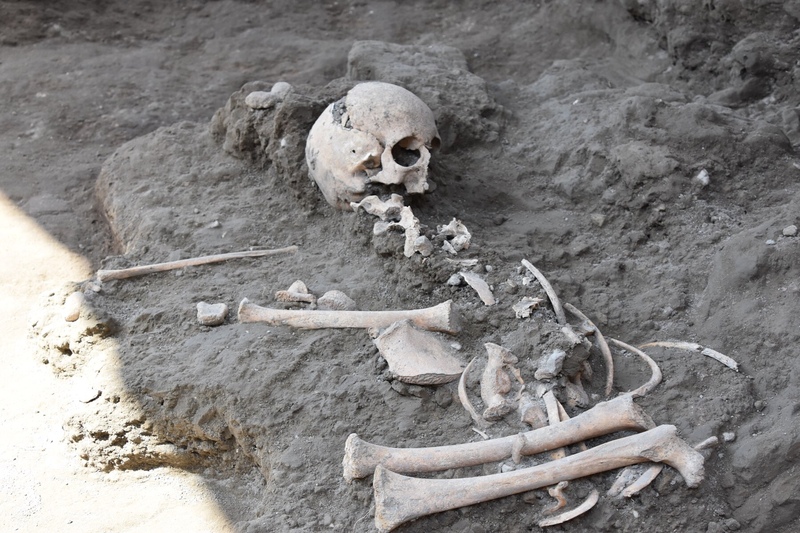 The skeletal remains of a child killed in the calamitous eruption of Vesuvius in 79 A.D. have been discovered in Pompeii’s Central Baths complex. The find was unexpected, a fortuitous discovery during work to strengthen and restore the complex that had already been extensively excavated in the 19th century. It’s also unusual from a stratigraphic perspective, because it was found just 10 centimeters underneath an entrance area instead of under a thick layer of pumice fall, another created by the pyroclastic flow of superheated gases and volcanic material and a top layer of ash sealing everything below. The child was covered only by the pyroclastic layer, not the pumice or ash. 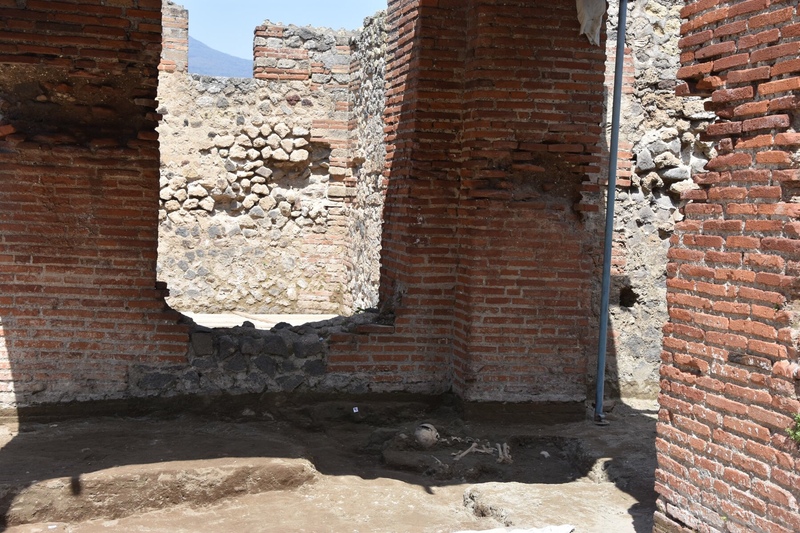 While the structures in the rest of the city experienced roof collapses from being pummeled by hot pumice for hours (many Pompeiians died from being crushed under busted roofs, not from the direct effects of the eruption), the area of the Central Baths where the child was found appears to have kept its lid. The pyroclastic flow must have come in through the windows, which is like something out of The Blob only way, way scarier. First to emerge was the child’s skull, followed by the articulated bones of the body. Because of its in situ, intact discovery, archaeologists were able to make an educated guess that the child was seven or eight years old at the time of death and that he or she had fled into the baths seeking refuge from the eruption. It’s a lucky that the find site was excavated in 1877-8 but the burial was not disturbed at that time, not dug up, no plaster cast made. That’s probably due to the ancient pyroclastic material being too difficult at that time to create a cast, and making the castings was the top priority. The Central Baths, located at the intersection of Via di Nola and via Stabiana, develop on the space of an entire block, the insula 4 of the Regio IX, made available by the leveling of pre-existing buildings, probably damaged by the earthquake of 62 AD. Their construction is later than that date and at the time of the eruption it was not completed. The entire complex is the subject of consolidation (treatment of holes, consolidation, perforation of the lesions, restoration of the walls, restoration of sill levels and thresholds, replacement of architraves) and restoration (revision and restoration of walls and walls of plasters, cleaning and restoration of the flood, of the tanks and of the staircase; restoration of the tubules in the calidarium) started last January.